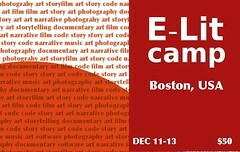 Plans have finally come together for E-Lit Camp Boston, Dec 11-13. More information on Mark Bernstein's site. E-Lit Camp is an informal weekend gathering for writers, artists, and programmers currently involved or interested in electronic literature. Work on your projects, give a presentation, collaborate, and learn from others. If you're a writer, artist, journalist, coder, or some combination of the above, E-Lit camp is for you. Have a project? Bring it. Don't have one? Bring your skills and creativity. Fiction is fab; documentary is cool. Bring your camera, laptop, projector, ideas, and anything else you need to be creative. Bring electronic works, Interactive Fictions, and videogames that you like, so we can try them out! In other news, my non-work life over the last few weeks has been a very technical one: Railscamp UK (thanks MrJaba! ), and writing Wordpress plugins. Good news: I move into an apartment today after 9 weeks of sleeping on floors and couches. Hurrah! Last Thursday, we launched the University Lives Collection in conjunction with the announcement of the World University Rankings by the Times Higher Education. Now it's time to finish the full site in preparation for our launch on November 16.